Dublin City Council overwhelmingly rejected an emergency motion to address the withdrawal of the Freedom of the City honour bestowed on Aung San Suu Kyi at tonight's meeting. The council was scheduled to vote on its 2018 budget but Councillor Mannix Flynn tabled an emergency motion ahead of the meeting urging council to suspend the standing order and to convene an immediate meeting of the Protocol committee to discuss what he called an "unprecedented situation for the city and it's councillors." He made the motion after Boomtown Rats frontman Sir Bob Geldof returned the Freedom of the City bestowed on him due to the controversy surrounding the Myanmar leader and fellow recipient of the award. He returned the scroll in what he admitted was a "publicity stunt" on the steps of Dublin City Hall this morning in which he referred to Aung San Suu Kyi as "a hand maiden to genocide" for her response to the plight of Rohingya Muslims in her country. Councillors voted 75.9pc against the motion to suspend the budget meeting to discuss the issue. Instead, council's Protocol Committee will discuss it at next month's council meeting. Following the vote, Mr Flynn accused his fellow councillors of "grandstanding." 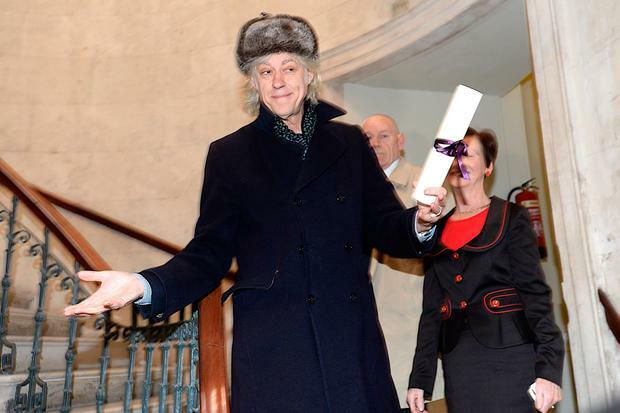 Bob Geldof returns his Freedom of Dublin city scroll to City Hall Dublin. Pic: Justin Farrelly. He said the reason Sir Bob Geldof gave back the award in the first place was because of the "delay in Dublin City Council doing anything with the Protocol Committee" in addressing the issue following widespread reports of ethnic cleansing of the Rohingya people under the Myanmar leader's regime. Earlier Mr Flynn said: "These are life and death issues for many people in Myanmar and all efforts must be made to expose this genocide, murder and injustice." He took issue with some councillors claiming Sir Bob Geldof and the media is "trying to set the agenda." "It's ridiculous they would even try to dream that's the case," he told Independent.ie. "But we did make some progress tonight in terms of the Sinn Fein amendment to my motion that there will be an emergency meeting of the Protocol Committee to deal with how we actually remove or strip the Freedom of the City from Aung San Suu Kyi," he said. "So that's positive," he said. Gareth Cross LYRA McKee had been planning to propose to partner Sara Canning before she was murdered last week, her funeral has heard. Independent.ie Newsdesk A man who had been reported missing has been found "safe and well", gardai have confirmed.